If you like word games, you will love Redonkulary®! It’s humorous and imaginative. As a former teacher, I am impressed by how this creative game encourages children and adults to engage higher level thinking skills and enjoy it! More importantly, Redonkulary® is a game we can play as an entire family and both ends of the age spectrum have fun. Thanks to Kristin’s ingenuous creativity and persevering spirit, we now have a clever new and challenging word game. If you like Scrabble, you will love Redonkulary®. My friend Kristin Miller Burrell has invented this fantastic game which should be widely available in stores and schools for a future with more creative and innovative thinking! This game is wonderful because it engages my students in creativity. The sounds of words pull associations from all of our brains – this is the basis for much of advertising. I would like to play this game in class at the start of each year to emphasize to students the importance of word choices (and of using words that sound good) when writing creatively – a poem, a description, fiction… and especially persuasive writing! What Gestures® is to charades, Redonkulary® is to any dictionary-type game – easier and exponentially more fun. The brilliance of the interchangeable word stems is almost magical. We laughed until our faces hurt and then turned the best ones into “hashtags” to keep them alive for weeks! This game is fabbilarary, which means fabulous, hilarious, and hairy. Except for the hairy part. Redonkulary® is one of those games that you can play again and again with both kids and adults. It’s simple enough to play a quick 5 minute round but thought-provoking enough that you can play for an hour. We can’t wait to get one for the car and one for the kitchen table! Redonkulary® only evolved from a brainstorm into a product with assistance from my many supporters. I want to express my sincere appreciation to everyone who helped make Redonkulary® possible. First and foremost, I want to thank my husband, Eric, who had supported me every step of the way, and most importantly, never stopped believing in me. I would also like to recognize our creative children, who were the impetus for Redonkulary® and who continuously inspire me to be a better mother. To my dear friends and family, who supported me every step of the way, I want you all to know how much I love you and appreciate you. In addition, I would like to recognize the many people who generously gave their time, talents, connections, and insights to make Redonkulary® possible. Thank you to my focus group participants for giving me feedback on a Redonkulary® prototype (Nancy Barrett, John Clark, Julienne Correa, Susan Donkers, Liz Gonzalez, the Halley/Park family, the Hamilton family, Sarah Hurley, Gloria Lozano, Raphael Mandujano, Benjamin Matthews, Karen and Larry Miller, the Munson family, Joy O’Hanlan, the Rees- Hoofnagle family, the Schmidt family, the Shaw family, Chantal Smith, Dana Tutela, Keary Warner, Katherine White, Sandi Wilson, and Matthew and Bailey Wolfer). To the subject matter experts who advised me on all aspects of business, including: the toy industry (Ryan Hamilton, David Wyman), linguistics (Phyllis Muller); launching a consumer product (Mat Franken, Matthew Klein, Dana Tutela); package design (Eric Burrell, Andew Hurley, Tim Morton); graphic design (Amy Knobel-Chester, Blake Langford, Roman Perez), graphic & web design (Adam Rogers), app development (Micah Brandenburg); intellectual property law (Parks Workman); business (Chris King, Scott Welchel, Amos Workman); marketing/public relations (Lara Shaw, Anne Stein, Beth Thomason, April White); banking (Ed Stein); and printing (Pam Prince). 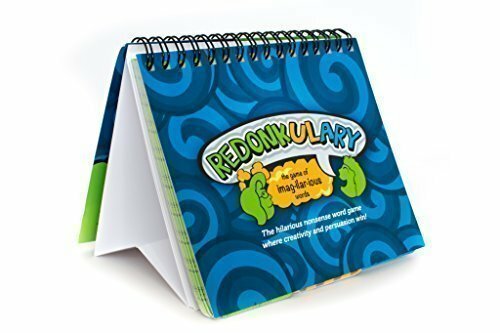 My friend, Ryan L. Hamilton (toy creator, consumer product strategist, and blogger at http://makerealstuff.com), was the catalyst for launching Redonkulary®. Having someone of Ryan's caliber believe in me and my ideas gave me the confidence to leap into entrepreneurship. Ryan has been there every step of the way, both as a friend and as a mentor, with timely advice and valuable insights. Thank you Ryan! To my fellow local game inventors (Ben Fields, Will Meadows, Ryan Pilz), thank you for so freely sharing the inside scoop behind your new game “Steam Court” and company, Tantrum House. I also want to say a big thank you to all of my supporters on Kickstarter! You made it possible for me to place that first big manufacturing order. Thank you Alissende, Bengt Gregory-Brown, Bryan Stout, Karen and Larry Miller, Joy R McManus, Hollace Cole Shantz, April White, Jade Fassbinder, Randy Pilz, Rebecca, Rebecca Gault, The Hotchkiss School, Pete Thomas, Amy Smart, Andy Hightower, Jeremiah Petersen, The Millers, Sally Hopfner & Robin Watson, Ryan Hamilton, Kirstin Ritchens, Delphine, Kerrie Larsen-Natiez, Tantrum House, Loren Oyervides, Brendan Sheehan, Jordan Karpowitz, Jon DeCou, Amy Chester, Phil & Yvette Bryant, Freck Family, Rebecca Thomson, billy Fulton, Dee-Ann Lack, britt Taylor, Kari L., Anne Culberson, David Haskins, John Clark, Iris McCannon, Liz Treynor, Brad H, Evan Sheldahl, Karen Blackett, Tim, The Buchanans, Kenny Hall, and all of the donors who wish to remain anonymous. I am astounded by your generosity! To the many other people who helped me along the way, I am grateful for support. Your connections, introductions, encouragement, and advice helped bring Redonkulary® to life. Thank you everyone!